Tyler Motte scored two goals in 11 seconds to lead the Vancouver Canucks to a 4-1 win over the New York Rangers on Wednesday. Tyler Motte's teammates tried hard to help him get his first NHL hat trick. Instead, the Vancouver Canucks centre had to settle for a pair of goals in his first multi-point game, a 4-1 win over the New York Rangers on Wednesday night. "I was just happy to get two chances and I was just happy to get them in the back of the net," said Motte. The 24-year-old has quietly contributed on offence this season, tallying a career-high nine goals and seven assists. "My game is pretty simple — be competitive, be hard working, be physical, be responsible in the D-zone," he said. "And obviously I've been able to chip in a little bit offensively over the year. That's not the bread-and-butter of my game, but it's nice to be able to do it, for sure." Brock Boeser and Jake Virtanen added goals for the Canucks (29-32-9). Vancouver goalie Jacob Markstrom stopped 21 shots and helped his teammates kill off a five-on-three midway through the third period. "We talked about responding and I thought we did that," said Markstrom. "And today, I thought it was a really good game for us through 60 minutes." Motte's goals came 11 seconds apart in a second period that saw the Canucks spend 10 minutes on the power play after Rangers forwards Chris Kreider and then Brendan Lemieux were ejected in separate incidents. "You lose two forwards and are completely out of synch and you kill 12 minutes of penalties in that period and it's really, really an incredible disadvantage," said New York head coach David Quinn. The first major of the night came 4:23 into the second period, with Vancouver's star rookie Elias Pettersson taking an elbow to the face from Kreider along the end boards. "I started bleeding from my nose so that's why I went down," said Pettersson, who returned to the Canucks' bench near the end of the period. "My head was feeling fine all the time. But of course, it's a protocol that you have to do they suspect you have a concussion." Kreider was handed a five-minute major and a game misconduct for the play. Vancouver capitalized on the ensuing man advantage with Josh Leivo flipping a backhanded pass to Boeser at the face-off dot. The right-winger dropped to his knee and unleashed a rocket, sailing the puck over Henrik Lundqvist's shoulder. Scoring on the power play has been a struggle for Vancouver through the second half of the season but Boeser felt it was clicking on Wednesday. "I thought we were moving more and getting more chances so it was positive tonight," he said. 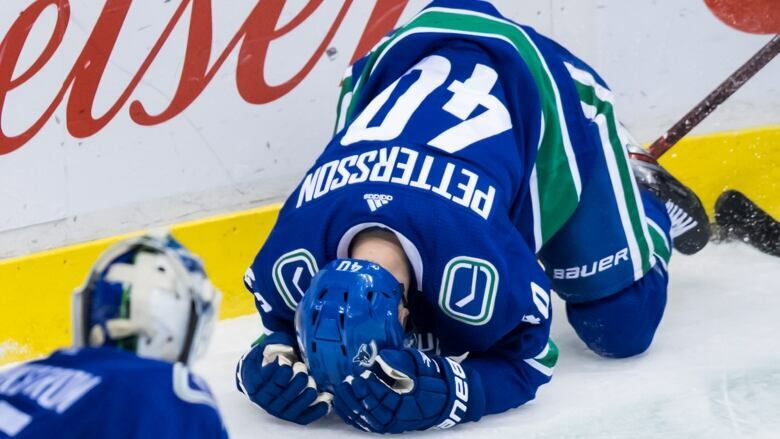 But Vancouver couldn't finish on the second five-minute penalty of the night, when Canucks left-winger Antoine Roussel collided with Lemieux in front of the net. Roussel crumpled to the ice, grabbing his leg in pain and had to be helped off the ice. New York simply didn't stay disciplined after the second major said Quinn. "You have to be mentally tough enough to keep playing and doing the right things and I thought we got away from what we were doing in the first period," said Quinn. "But there was an awful lot going on in that period, boy, an awful lot of frustration setting in with that second five-minute major, it put us in a different mindset."